AutoCAD includes four more xref-like features: the ability to attach raster images, DWF files, PDF files, and DGN files to drawings. The image feature is useful for adding a raster logo to a drawing title block or placing a photographed map or scene behind a drawing. A raster, or bitmapped, image is one that’s stored as a field of tiny dots. Raster images often come from digital cameras or from other programs, such as Photoshop. Raster images can also come into the computer from some kind of scanner that imports a blueline print, photograph, or other image. Your raster image may be distorted a bit; for example, the aspect ratio (ratio of width to height) may not be correct, but AutoCAD won’t let you change it. No problem; simply attach the raster image, make a block that contains it, and then insert the block with different X and Y scale factors. Using raster images is much like using external references. The raster image isn’t stored with your drawing file, though. Instead, a reference to the raster image file is established from within your drawing, like an xref. You can clip the image and control its size, brightness, contrast, fade, and transparency. These controls fine-tune the appearance of the raster image onscreen and on a plot. When you attach raster images, you have to make sure that you send the raster files along when you send your drawing to someone else. Raster images are simply referenced from the drawing and aren’t part of it. If you don’t send the raster image file along with the drawing, the drawing displays a rectangle containing the name of the missing file in its place. The best way to make sure that you get all the required files when sending a drawing file to someone else is to use the ETRANSMIT command. Some raster image files that you find on the Internet may not be appropriate as AutoCAD attachments. If the External References palette isn’t already open, click its icon on the Palettes panel of the View tab. Use the drop-down list on the first toolbar button to attach a drawing; an image; or a DWF, PDF, or DGN file. Click Attach Image and locate the image file you want to attach. The Attach Image dialog box appears. Browse to find the file you want to attach, select it, and then click Open. Click the Show Details button in the Attach Image dialog box to see more information about the resolution and image size of the image you’re attaching. Specify the parameters for the attached image in the dialog box. 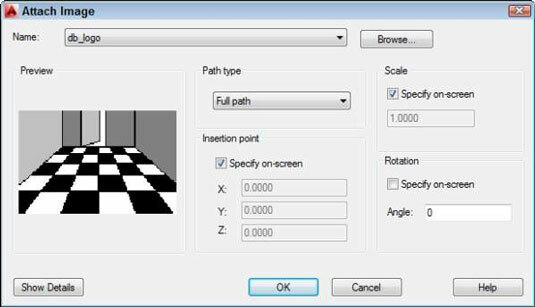 Parameters include the insertion point, scale factor, and rotation angle. You can set these parameters in the dialog box or specify them onscreen, similar to what you can do with blocks and external references. The Attach Image dialog box includes the same Full Path, Relative Path, and No Path options as those for attaching xrefs. The image appears in your drawing. If you need to ensure that the raster image floats behind other objects in the drawing, select the raster image, right-click, choose Draw Order, and then choose Send to Back. The DRaworder command provides additional options for which objects appear on top of which other objects. If you need this kind of flexibility, look up DRaworder command in the AutoCAD online help system.